Davam Urgent Care located near Montgomery, TX offers walk-in medical services for the entire family. Our family clinic is able to treat patients of most ages ranging from children to adults. Each patient who visits Davam will always be treated by a board-certified medical provider. We are also open 8am-9pm, 7 days a week, to allow for convenient visit times outside of work and school hours. Our wait times are typically less than 10 minutes, and an appointment is not required. Patients may check-in online to reserve a same day visit time. In addition to providing treatment for many medical medical conditions, Davam Urgent Care also offers other medical services. This includes school physicals, sports physicals, digital x-ray, lab services, drug screening, EKGs, and more. We also have a kid friendly room to allow for a more pleasant visit experience. 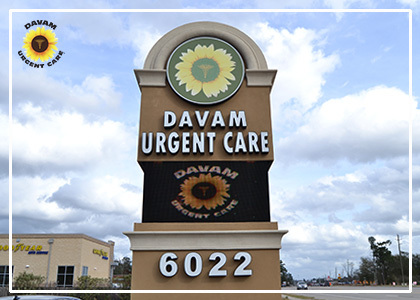 For more information on Davam Urgent Care located near Montgomery, TX please visit our website at www.Davam.com or call (281) 583-1980. Our family clinic services the Montgomery neighborhoods of Woodforest, Bentwater, April Sound, Highland Ranch, Canyon Creek, Eagle Pointe, Highland Ranch, High Meadow Estates, Ponderosa, Waterstone, Kinderwood, and more. We also serve the Montgomery zip codes of 77316, 77365, and more.